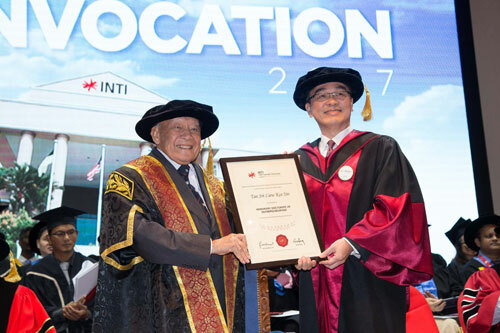 Chairman of Eco World Development Group Berhad and a pivotal figure in Malaysia’s property development industry, Yang Berbahagia Tan Sri Liew Kee Sin was today conferred the Honorary Doctorate of Entrepreneurship by INTI International University. 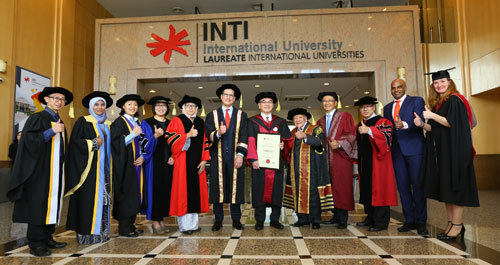 His very first doctorate, Tan Sri Liew received this recognition for his exemplary business leadership both in Malaysia and internationally, for promoting nationalism through the AnakAnakMalaysia campaign and his commitment towards Eco World Foundation’s Students Aid Programme which helps school children in need. He was awarded the doctorate by Yang Berbahagia Tan Sri Dato’ Seri Utama Arshad Ayub, Chancellor of INTI International University (INTI) during the university’s November 2017 Convocation Ceremony, which celebrated the graduation of more than 1070 students across INTI’s PhD, Master, Bachelor, and Diploma programmes over the course of three days. In his acceptance speech, Tan Sri Liew, who has led two of the nation’s premier development companies over the last 26 years, and was instrumental in securing the coveted Battersea Power Station regeneration project in the UK in 2012, expressed his gratitude for the award and shared with students about the meaning of success. Tan Sri Liew Kee Sin, Chairman of Eco World receiving his Honorary Doctorate in Entrepreneurship from Tan Sri Dato’ Seri Utama Arshad Ayub. “The value of education cannot be stressed enough, particularly in today’s increasingly borderless world. Education has the ability to transform lives, to build communities and uplift nations, and those who have the opportunity to receive an education must recognise their role in driving positive change, as many of Malaysia’s forefathers did when the country first gained its independence. “As graduates of the 21st century, it is important that young professionals be driven by goals and a vision of success, but even more so that they uphold the values of humility, integrity and unity in whatever they pursue. The true measure of success is what an individual gives back to society through intellect, effort and a resolute passion to make a difference not only in his or her own life, but to everyone around them,” said Tan Sri Liew. The graduates moving forward today will join a growing community of INTI alumnae who are carving out bright futures for themselves both in life and in their careers. Since its establishment in 1986, more than 55,000 individuals have gone through INTI’s rigorous academic programmes, gained insightful industry experiences and have paved successful careers both locally and abroad. Some of INTI’s most notable alumnae include Dato Danny Cheah; the Executive Director of the Mammoth Empire Group, Lau Seng Yee; Senior Executive Vice President of Tencent Holding Ltd and Ng Cheong Choon; the inventor of the global phenomenon: the Rainbow Loom Bands. “At INTI, we empower students to be innovative, driven and to approach their lives and careers with an entrepreneurial mind set. These are the same admirable qualities which reflect Tan Sri Liew’s extensive services to the property industry and country, and who represents a pivotal figure for those who aspire to become future entrepreneurs. We are very proud to name him as our first Honorary Doctorate of Entrepreneurship recipient today,” concluded Professor Rahmah.